Honey Whipped Body Cream ($22): air has been incorporated into this delicate texture, making it reminiscent of the whipped desserts we loved as children�As light as air and incredibly soft to the touch, it melts onto the skin like a caress. Honey Foaming Gel ($20): with a glowing golden color and a velvety fluid texture, this shower honey will cleanse the skin with the gentlest touch. 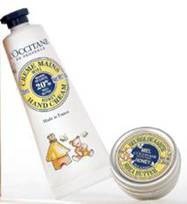 Shea Honey Hand Cream ($10): the famous L’OCCITANE Hand Cream made with 20% Shea Butter is now infused with a subtle honey scent. 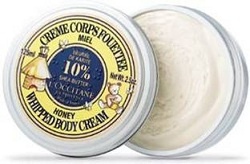 Honey Shea Butter ($10): an ultra-nourishing spot treatment to soften even the driest skin. Use on elbows, lips, cuticles, feet, and even hair!